Between the early seventeenth and the mid-nineteenth century, the field of natural history in Japan separated itself from the discipline of medicine, produced knowledge that questioned the traditional religious and philosophical understandings of the world, developed into a system (called honzogaku) that rivaled Western science in complexity—and then seemingly disappeared. Or did it? 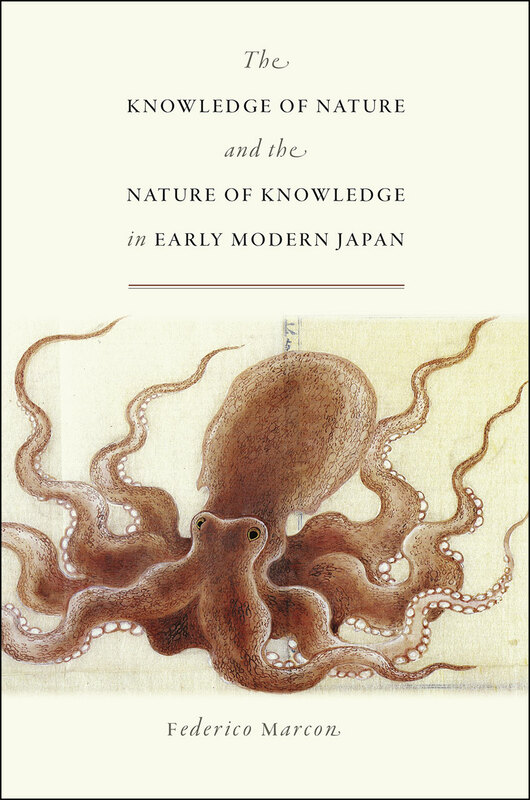 In The Knowledge of Nature and the Nature of Knowledge in Early Modern Japan, Federico Marcon recounts how Japanese scholars developed a sophisticated discipline of natural history analogous to Europe’s but created independently, without direct influence, and argues convincingly that Japanese natural history succumbed to Western science not because of suppression and substitution, as scholars traditionally have contended, but by adaptation and transformation. The first book-length English-language study devoted to the important field of honzogaku, The Knowledge of Nature and the Nature of Knowledge in Early Modern Japan will be an essential text for historians of Japanese and East Asian science, and a fascinating read for anyone interested in the development of science in the early modern era. "Opens a fascinating window into the history of Japan's relationship to its natural environment. . . . The book charts transformations not only of natural objects and studies of them in Japan, but also of the professional and social identity of scholars, the disciplinary identity of the field, the popular engagement with natural history, and the illustration of the natural world. . . . A must-read for historians of early modern science, natural history, and Tokugawa studies!" "Federico Marcon’s rich history of honzōgaku makes an enormous contribution to the field of early modern Japanese history. Given the inseparability of honzōgaku’s scientific advances and concurrent epistemological shifts, The Knowledge of Nature and the Nature of Knowledge in Early Modern Japan is as much about the evolving state of knowledge as it is an investigation of nature studies itself....Both fascinating and authoritative, it is destined to endure as a distinguished study of early modern Japanese thought." "The main contributions of this book lie in its sophisticated analysis of the social and institutional contexts for the production and consumption of knowledge about nature in Tokugawa Japan and in its reconsideration of prevailing discourses that equate the development of science in Japan with a process of Westernization. Its engagement with not only the history of science, but also such fields as environmental studies, economic history, the history of the book, and art history, make it an essential resource for a wide range of readers." "Books that invoke big thinkers’ names abound, but few engage the ideas as profitably as this. The Knowledge of Nature and the Nature of Knowledge in Early Modern Japan is a magnificent work, erudite and sophisticated. This is the most stimulating work in the early modern field to appear in some time." "Marcon boldly challenges the hoary notion that the disenchantment of the world through scientific investigation was unique to the West. Like their early modern European counterparts, Japan’s honzogaku scholars systematically transformed natural ecosystems into discrete objects of analysis, manipulation, and control. This exciting study places Japan’s independent scientific trajectory in the context of its growing commodity culture and professionalization of scholarship."